The Neutralization by the Drop Titration Method Kit contains an easy and hands-on titration experiment. It's a great way to teach the principles of acid and base titration to students with a limited laboratory background. It eliminates the need for expensive laboratory equipment for teaching titration and includes all necessary materials, alleviating extensive lab preparation. 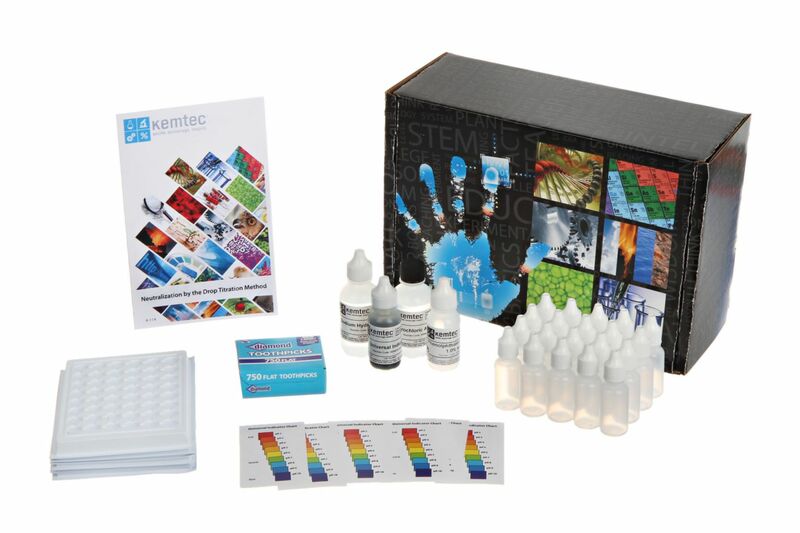 The kit is ideal for leading discussions about titrations, acids, bases, pH, buffers, or environmental or physiological buffering systems in a range of science applications from biology to environmental sciences to physiology. Ordering information: This kit includes a SDS universal indicator, sodium hydroxide, hydrochloric acid, phenolphthalein indicator, dropper bottles, toothpicks, a universal indicator chart, and depression plates.